Have you been baptized? If you have, you no doubt remember the day and its significance to you. I was baptized in the South Saskatchewan River when I was 14. We got instruction on the meaning of baptism before the event, so that I understood how being thrust under the water was a symbol of death to sin, how coming up out of the water a symbol of resurrection or new life, how the white dress we girls customarily wore was a picture of my purity in Jesus, and how my baptism was a sign to anyone watching that I was a Jesus-follower. Here John was baptizing people who were repentant. We don't know how John accomplished this physically. Perhaps he scooped water in his hands and poured it over the head of the person being baptized. Or maybe he tilted the person backward (or forward) immersing their entire body in water for a second or two (the way I was baptized). Whatever method he used, the water running over the person in the baptismal act no doubt signified cleansing then, as it still does now, and the publicity of the act was a sign then, as now, of spiritual allegiance and intention to everyone watching. In the midst of his baptizing, John explained something to the crowd: that he was just a forerunner of the real Baptizer. He was referring, of course, to Jesus, of whom he said: "He will baptize you with the Holy Spirit and fire." 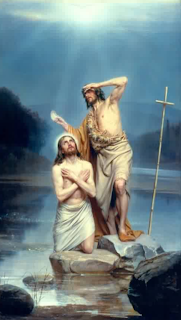 "John's baptism is a type of the salvation experience of being baptized in the Spirit. As John's baptism placed the individual in the medium of water, so the baptism of Jesus places the Christian in the Spirit, identifying him as bound over totally to the Lord (Acts 2:4; 1 Corinthians 12:13; Ephesians 5:18)" New Spirit Filled Life Bible p. 1294. - Just as water covers us in the act of baptism, the Spirit fills us when we are Spirit-baptized. Acts 2:4: "And they were all filled with the Holy Spirit or as the Amplified translates it: "And they were all filled (diffused throughout their souls) with the Holy Spirit." Ephesians 5:18: "...ever be filled and stimulated with the Holy Spirit" - Amplified. The Spirit's presence within us cements us together with other Christians in "one body" — the church. Our belonging is no longer dependent on or defined by race or culture but by the Spirit's presence in us. 1 Corinthians 12:13: "For by one Spirit we were all baptized into one body..."
When John hesitated to baptize Jesus, insisting that it would be more fitting for Christ to baptize him, Jesus replied "'Permit it to be so now for thus it is fitting to fulfill all righteousness.'" In other words, Do this; it's the right and God-way of doing things. If you are a follower of Jesus and have not been water baptized, perhaps you should consider it. Though it is a simple even foolish-looking act, your following of Christ's example in this will bind you in loyalty to Jesus and fellow Christians, and flesh out what happened when the Spirit came to fill the inside of you. PRAYER: Dear Jesus thank You for the symbolic act of baptism that illustrates what happens when You saved me and filled me with Yourself. Help me to open myself fully to the life of the Holy Spirit in me. Amen. inaudible whisper in a garden. Does He really not know? will not hold me back. “You are my Son whom I love. I really like the different perspective of your poem. Thank You.